A few weeks ago Cherry Culture had a sale. 20% off your order and free shipping over $40. This was the first time I ordered from Cherry Culture. I picked up an extra birthday gift for my mom and ordered myself 4 of the L.A. Girl Ombre Kits for $5.99 each. You get 5 mini polishes in each kit. I'll have swatches of these soon. I have a bad slice on my thumb right now. I'm waiting for it to heal, so I can show all 5 colors on my nails when I take photos. I was also able to get 3 China Glazes colors I've been wanting forever. They were $3.99 each. Strawberry Fields, I'm not Lion, Riveting. 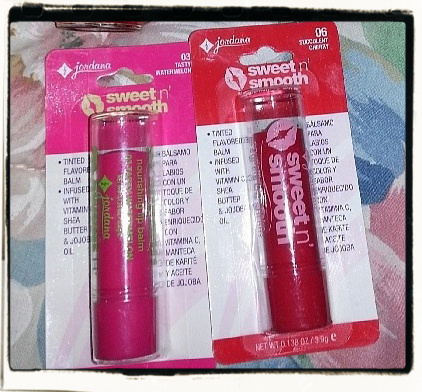 And last but not least, I ordered 2 Jordana Sweet N' Smooth lip balms. I've seen these reviewed on Confessions of Sarcastic Mom and I've always wanted to try them. I got Watermelon & Cherry. I've tried them both and they taste really good and make your lips super smooth. This last one wasn't from Cherry Culture. My husband & I went to Wegman's Grocery last night for a splurge shopping trip and I got these two Badger Balm products down the organic aisle. I got Lime Rocket lip balm & I also decided to get the cuticle care to carry in my purse. It smells like oranges & rosemary. (Mandarin oil is one of the ingredients).